Last time I saw Sacramento dance-punk torchbearers !!! 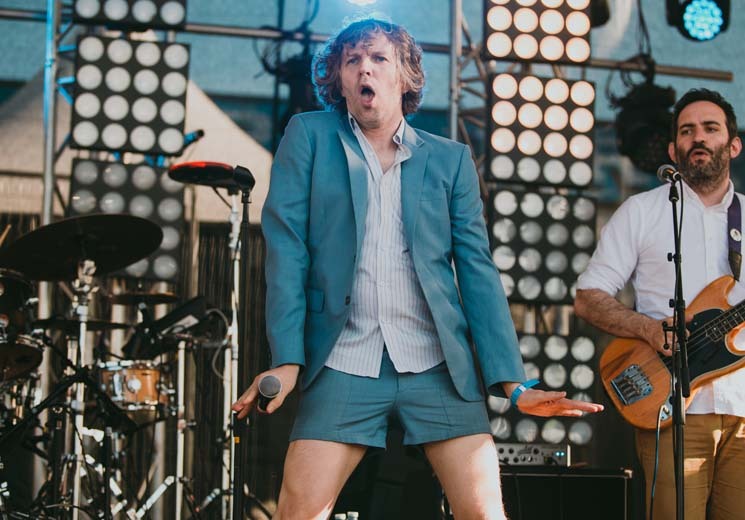 (aka chk chk chk) was at the Sasquatch Festival in 2011, and frontman Nic Offer was almost out of hand. He shat all over the event's sponsors, and stretched security's nerves by running throughout the surging crowd and climbing parts of the stage that no one else would think to. It was a totally different story this time. He didn't insult Phillips Beer. In fact, he encouraged everyone to come back the next day to see the Revolution, whom he'd seen on their current tour and loved. Wearing a powder blue suit jacket and matching shorts with that high '70s cut, Offer looked like an old man playing a little boy, and he still acted like one in the best way possible. He interpretive funk-danced from one end of the stage to the other and beyond, roamed the photo pit, climbed scaffolding to the very top of the stage for some sky hamming, and crawled the fence along one side of the dance pit, through the crowd back to the stage. This is all part of the !!! philosophy to service every discernible area of the crowd. With his band providing all the dance floor lubrication necessary, pulling most of the grooves from their Elton John-endorsed 2017 record Shake the Shudder, Offer's Jagger-esque mania was balanced out whenever Lea Lea was onstage, feeding moves off each other as she held her own in a mirrorball dress, and lent much-needed feminine energy to their dancing fool music. She made it feel more like the Happy Mondays did on their club mix of "Hallelujah." Granted, Offer is still a far better performer than he is a singer, which embodies the punk part of their dance sound, but enthusiasm can sell just about anything. It's not the size of the talent; it's how you use it.